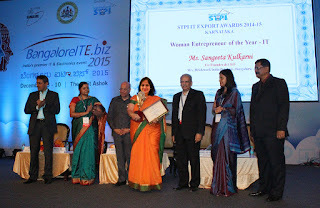 December 9, 2015: Ms. Sangeeta Kulkarni, Co-founder & CEO has been awarded the STPI IT Export award, ‘Woman Entrepreneur of the Year – IT” for 2014-2015. She was felicitated at the STPI IT Export Awards 2014-15 function held at Hotel Lalit Ashok on Tuesday 8th December 2015. The event was co-hosted by Software Technology Parks of India (STPI) and was held as a part of BangalorITE.biz (2015), India’s premier IT & Electronics event. She received the award from Dr. Kasturirangan, Ex-chairman of ISRO and Space Commission, ex-member of Rajya Sabha and Mr. Kris Gopalakrishnan Co-Founder & Executive Vice Chairman, Infosys Ltd. The award commends her for the impact she has made in the business world as a woman entrepreneur and the effect her organization’s contributions has had on the world of business. Under Ms. Sangeeta Kulkarni’s leadership, Brickwork has experienced all-round business growth and has become the world’s largest provider of remote executive assistance services. With strong focus on business excellence, she has driven revenue growth over 500% which is an achievement in itself for a business that is highly complex, diverse and demanding. She has built a global brand catering to diverse service requirements of clients located across 116 countries by implementing innovative business & people practices and strongly leveraging processes and technologies. Ms. Kulkarni’s plans, policies and initiatives have fostered growth, recognition, commitment and success among employees. Her continued focus has been to establish an open collaborative work culture which supports inclusive and sustainable growth. She co-founded Brickwork India in 2005. She holds a Master’s degree in Human Resource Education and is an alumnus of Boston University and North-western University, USA.